“Barbara’s Sunshine” is a beautiful dwarf hardy Aussie perennial with a most spectacular display of bright flame yellow flowers held atop soft silver foliage. It is an adaptable species mass flowering though out spring and into summer. Native bees and butterflies find this wonderful plant hard to resist and congregate en masse though out the flowering season. “Barbara’s Sunshine” looks great planted out as a border, mass planted in the landscape for swathes of silver and yellow or an excellent pot specimen using a premium Australian native potting mix. The beautiful foliage is an added bonus on the occasion that “Barbara’s Sunshine” is not in flower. “Barbara’s Sunshine” grows and flowers best in a well drained soil in a full sun position. If the soil is poorly drained a raised garden bed is recommended. 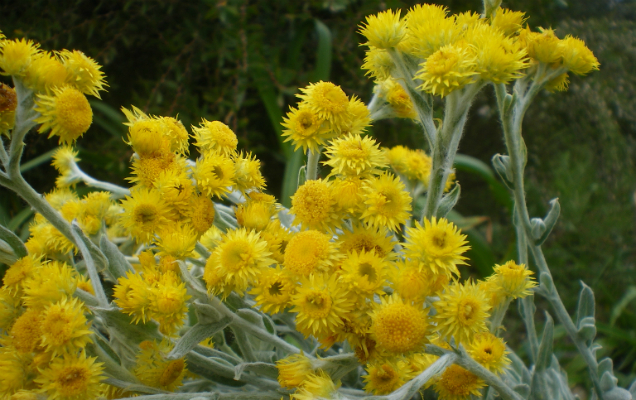 “Barbara’s Sunshine” is a hardy plant tolerating extended dry periods and heavy frost. After establishment in the ground “Barbara’s Sunshine” requires no extra watering. Named for David and Barbara Jones, dedicated plant and nature enthusiasts.